Placed 23rd in the 50 free (20.44) 15th in the 100 fly (47.83) and seventh in the 100 back (47.97) at the UGA Invite…posted her personal best times in prelims in the 100 fly and 100 back…was also 16th in the 200 back (1:47.36). Scored points in all three of his individual events at the ACC Championships while establishing new personal bests in each race…placed 21st in the 100 fly before taking 13th in the 100 back and was also 22nd in the 200 back… tied for 14th in the 100 fly with a time of 45.56 at the Georgia Invite and was 15th in the 100 back at 49.05…turned in his best finish at the meet in 13th in the 200 back at 1:46.58. Comes to Tallahassee through the pipeline from Indian River State College…was the 2014 NJCAA National Champion in the 50 free before he set the national record leading off the 100 back in the 400 medley relay…he placed second in the 100 fly and 100 back. 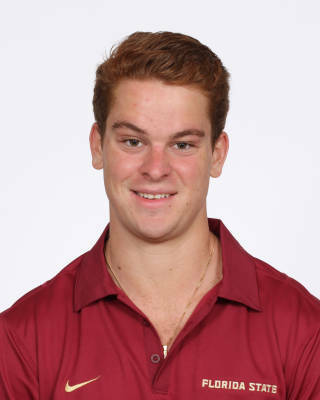 Born Jan. 26, 1993…son of Krunislav and Sladjana Stojmenovic…made the Dean’s List at Indian River State College…also played soccer…a native of Sweeden where he swam for Norrkopings Kappsimnings where he was coached by Hakan Hertzman.